Breakout single "I Love College" celebrates a middle class, chemically induced naivete, as if contentment and maybe even transcendence can be chugged, blazed or shagged. And, who knows, maybe Roth is onto something. 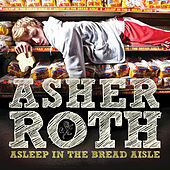 The song is an undoubtedly catchy, sublimely inspired bit of pot-cult ephemera (and probably the soundtrack to your next keg-stand), but Roth does seem a bit silly (or cynical) when he expresses his desire to "go to college for the rest of my life." Still, Roth is more than a novelty -- but just barely. He has a flat whine for a flow, but he puns and juggles his syllables adeptly, even if his stabs at pathos ("His Dream") are laughable. He's best when he's rapping with a smirk, even if you kinda want to knock it off his face. 2009 Universal Records, a Division of UMG Recordings, Inc. and SRC Records, Inc.